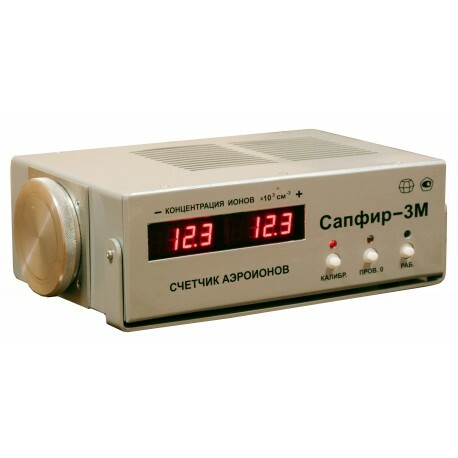 Sapphire 3M is designed for gauging the concentration of light air ions. The counter is able to concurrently gauge both positive and negative. Sapphire 3M can be applied in electronic production (clean rooms), on trading floors (stock exchange), in textile industry and printing industry. Can be used to monitor air ion parameters to ensure normal parameters of ioization are maintained in the artificial atmosphere. The gauge counts both the concentration of positively and negatively charged ions concurrently, it is important to objectively appraise ionization parameters. The ion counter is fully automatic and is easy to operate. The high results credibility is provided by the large-sized aspirating chamber, specifically at high ion concentration (more than 100,000 / cubic cm). The gauge is able to do time averaging for a given (configurable?) period. Big LED display is handy when taking many gauges of ionization in series. The gauge is essential when calibrating air ionizers. It is both line and battery powered. Its operation is controlled by an ATMEGA processor. You can download the PC Software below to control, take automatic gauging and do basic processing of observations made by Sapphire 3M.